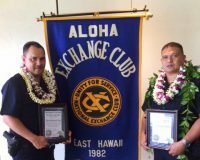 The Aloha Exchange Club of East Hawaiʻi recognized Puna Patrol Officers Eddie Cardines and Whitman McCallum on Thursday (August 25) as “Officers of the Month” for July and Vice Officer Zenas Pacheco as “Officer of the Month” for August. Officers Cardines and McCallum were honored for their actions that led to the immediate capture of a triple homicide suspect. 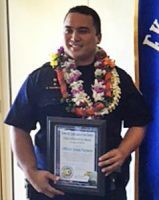 Officer Pacheco was commended for reducing the supply of methamphetamine in East Hawaiʻi. In the early hours of May 6, Officers Cardines and McCallum were dispatched to a report of a possible gunshot victim in Leilani Estates. As they were trying to locate the house, McCallum noticed a vehicle leaving the area without its lights on. He alerted his fellow officers and attempted to make a traffic stop, but the driver evaded him and drove away. Officer Cardines caught up with the vehicle a block away and made a felony traffic stop. After the suspect was apprehended, Cardines inspected the car, preserved critical evidence in danger of being washed away by a sudden downpour of rain, and made observations that ultimately led to the discovery of a woman’s body in the trunk. Once the suspect had been secured, McCallum joined another officer to check the suspect’s house, where they discovered the bodies of two young children. Officer Pacheco’s award was for seizing what Acting Lieutenant Brian Miller described as an “unheard of” amount of methamphetamine in East East Hawaiʻi. “Within the past two months, Officer Pacheco has recovered approximately 6 pounds of methamphetamine, which was headed to high-level drug suppliers in East Hawaiʻi,” Miller wrote in nomination papers. In one case, a suspect who was in the custody of Hawaiʻi Community Correctional Center had been distributing meth while out on work furlough. Pacheco recovered 11.5 ounces of the drug after executing a search warrant on the inmate’s car in June. Officer Pacheco developed enough information to conduct a joint operation with the Drug Enforcement Administration in July on the supplier of the man arrested in June. They recovered more than 5 pounds of meth, leading to the arrest of the supplier, who is facing a mandatory 10-year sentence to federal prison.